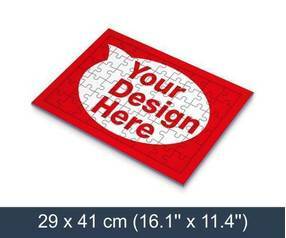 Tray jigsaw puzzles offer you the possibility to promote your services or business attractively. You can upload your design, photo or artwork, choose the tray puzzle size, piece amount, coating – matte or glossy, and you can choose between single or double-sided print. Each tray jigsaw puzzle is individually shrink-wrapped in a transparent foil which is great as the jigsaw puzzles can be distributed without a box! Tray jigsaw puzzles are basically standard jigsaw puzzles. The only difference is that they have a frame around the pieces and cardboard backing which holds the puzzle pieces together. These jigsaw puzzles will be fun to solve for kids as well as for adults! With tray jigsaw puzzles you can be sure that your marketing message will be well received, as the receiver of this jigsaw will put the puzzle together at least once, thereby engaging in your promotion. Once solved there is no need to disassemble the puzzle as the tray around the pieces holds the jigsaw together. In comparison with standard jigsaw puzzles, tray jigsaw puzzles offer you the possibility to print on both sides. You can have your design displayed on the front and back of the tray puzzle. The minimum order starts from only 50 units for the larger A3 tray jigsaw puzzles and 100 units for A4 and A5 size jigsaw puzzles. Our online editor allows you to upload your design or create one from scratch. Easily upload photos and add messages to your custom design. Our online editor will enable you to personalise both sides of the jigsaw! We firmly believe that tray jigsaw puzzles made with your custom design will be a much more attractive distribution material than standard flyers. Tray jigsaw puzzles are excellent marketing material that stands out! To start creating your tray jigsaw puzzle select jigsaw size and upload a photo, design or artwork!